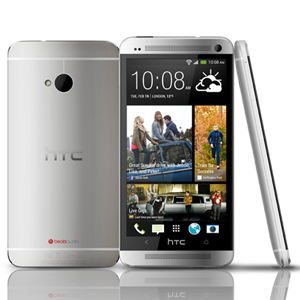 The HTC One, formerly known by the code name M7, is HTC's flagship device for 2013. The device features a powerful quad-core 1.7 GHz Qualcomm Snapdragon 600 processor (APQ8064T), 2 GB of RAM, 32 or 64 GB of storage, a 4.7″ 1080p Super LCD 3 display with 468 ppi, a 4 MP “Ultrapixel” camera with an f/2 lens and large pixels, and a 2300 mAh battery. All this is housed in a sleek, 9.3 mm all-aluminum enclosure that feels thin due to its tapered edges and sub-4 mm minimum thickness.